The FAI World Air Games officially kicked off with a bang last night, as the 3,000-strong audience at the Opening Ceremony were wowed with an extravaganza of dancing, zip-line performances and fireworks. 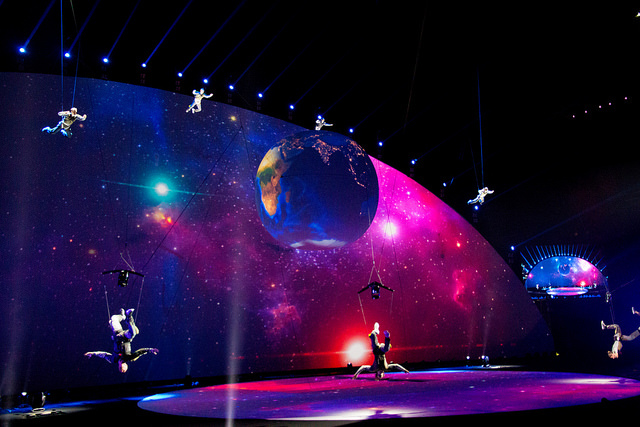 Dropping in on the open-air stage, performers dressed as skydivers and paramotor pilots flew over the crowd suspended on wires, taking the astounded audience on a theatrical flight over glorious Dubai. "It was great," said Polish microlight team member Kajetan Ruks. "I've never seen anything like it before. And now, I want to see it again." The musical ceremony mixed the new with the old, presenting a fascinating insight into the history, culture and ambition of this unique location. Representatives and competitors from more than 50 countries were in attendance, as was guest of honour, His Highness Sheikh Mansoor bin Mohammed bin Rashid Al Maktoum. Joao Franciso, who came from Portugal to compete in the air navigation race said of the ceremony: "On a scale of one to 10, I give it 20!" It's hoped that this World Air Games will help to close the gap between air sports and the Olympic Games. After the show, his Excellency Yousif Hassan Al Hammadi, president of the World Air Games, told us that he hoped the games would bring people from around the world together in a spirit of love and peace. FAI President Dr John Grubbstrom added that he thought the ceremony was "unforgettable". In his address on the 40-metre screen set up especially for the event, he wished all the competitors a safe, fun and enjoyable time. Competitions in the more than 20 air sports represented continue tomorrow at five locations around Dubai, running until December 12.